If Morpheus had a business card it would say "Lord of Dreams" on it. The hero of Sandman is tall and pale and forlorn and goth-looking, and he's part of a pantheon of gods, including Death, Delirium, and Desire, who secretly rule humanity. Morpheus's dealings and struggles with humanity and with his fellow gods are the subject of this dark and rather literary series of comic books, written by Neil Gaiman and illustrated by a rotating (but uniformly brilliant) cast of artists. Gaiman's assessment of human nature is grim, and the comics sometimes veer from fantasy into horror  the tone is more like the hard-bitten, hard-boiled depression of Raymond Chandler than the whimsy of J.K. Rowling. 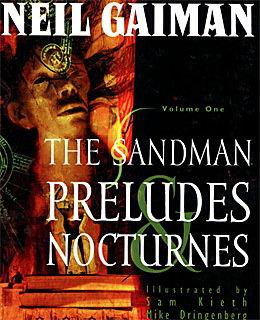 But Sandman is never without a surreal, lyrical, hypnotic fascination, and it's catnip to brooding teenagers.